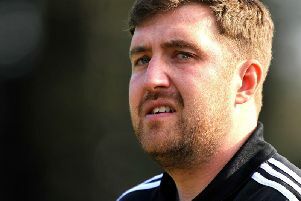 Horsham manager Dominic Di Paola has revealed that his players are more aware of the points-per-game promotion situation than he is so there is no danger of them taking their foot off the pedal. The Hornets need four more points to guarantee a place in the Bostik League South East Division play-offs. With four games left to play, due to their superior goal difference, it is likely just one win will ensure a spot in the promotion games. But with new leagues at Step 4 not all play-off winners will be promoted this season. When combined with league winners there will be 14 teams vying for 12 promotion places, so the play-off winners to go up will be decided on the best points-per-game ration. That will leave two sides heartbroken and Di Paola, while realising there is a long way to go, has said that is already in his players’ minds. On if they could let up when the play-offs are secured, he said: “The players would be idiots if they did. They all know the points-per-game thing more than I do. If they take their foot off the gas now and as a result did not get promoted, they would be crazy. “They know they need to pick up as many points as possible to make sure that doesn’t happen. They know the permatations more than me - I know they all talk about it and have their own WhatsApp group. “If you took your foot of the pedal and then your form and points meant you didn’t get promoted after possibly winning a play-off (you’d be devastated). “There is a lot still to play for and we want to keep things ticking over, then again you could end up going all the way and not getting anything. It’s a right old weird set of circumstances. At Step 3 they will be holding super play-offs to decide the promoted teams and Di Paola agrees this seems a much fairer way of sorting things. He continued: “If they are doing super play-offs for some leagues it should be the same for all of them. If you win a promotion it would then at least be on games of football. Third-placed Horsham will be looking to all-but seal a play-off place when they travel to Sittingbourne on Saturday.